This report is designed to help you make an informed decision about PeopleFluent. 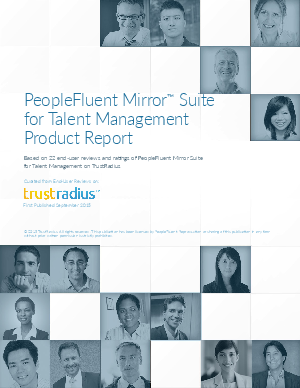 It is based on 22 current, in-depth user reviews and ratings of PeopleFluent Mirror Suite for Talent Management on TrustRadius, the trusted user review site for business software. By crowd-sourcing user perspectives, we help you to get a true sense of the product and what it’s like to work with the vendor. Download this report for an analysis of the types of customers (company sizes, industries etc.) that use PeopleFluent, a discussion of its key use cases, what companies and users like most about the product, and areas for improvement, as well as comparisons that show how PeopleFluent stacks up against other leading talent management products. It also includes independent research and an interview with the vendor.